Armondo “Chuck” C. Azzinaro, 94, passed away on Saturday afternoon, February 2, 2019 at his home. He is survived by his wife, Margaret “Peggy” M. (Cook) Azzinaro of Westerly, his daughter, Judith Ann Buck (Ronald Noyes), his son, Robert Buck (Kimberly), his grandchildren, Bruce, Rachel and Renee’ Buck, his great-granddaughter, RaeAnne, his step-children, Michael Davis (Susan), Timothy Davis, Robert Davis (Marla) and his step-grandchildren, T.J. Davis, Victoria Davis, Michael Davis, Raymond Davis, Raffaele Davis and Lilly Davis and many nieces and nephews. He was pre-deceased by his first wife, Ann M. (Celularo) Azzinaro on June 23, 1997, his step-son, Peter Davis, also his brothers and sisters, Frank, James, Angelo, Theresa Sposato and Nancy Terranova. Mr. Azzinaro was born in Westerly on April 13, 1924, the son of the late Charles and Mary (Giorno) Azzinaro. Chuck was a proud member of the United States Army who was a veteran of World War II and the Korean War. He was a member of Company C, 6th Infantry Regiment, 3rd Army when he landed on Omaha Beach two weeks after D-Day making his way to fight in the Battle of the Bulge. After 22 months overseas, he came home and signed up with the National Gaurd and then Battery D, 705th AAA Gun Battalion and was called back to active duty in 1950. Chuck became the first field instructor for the 90mm anti-aircraft guns in the Korean War. He retired as a Master Sargeant. Armondo was a lineman for Narragansett Electric for 20 years. 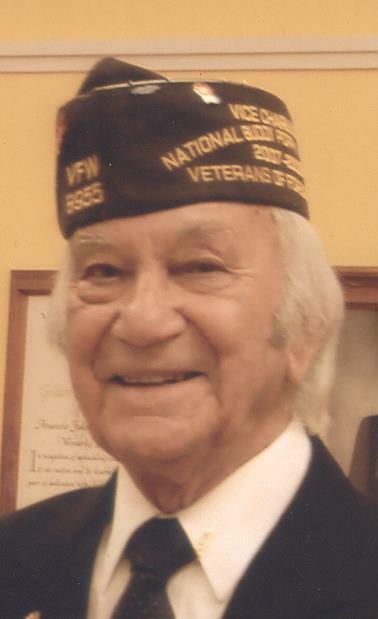 He was an active member and Past Commander of the Amancio-Falcone-Gaccione Post #8955 Westerly Veterans of Foreign Wars and Past State Commander of the Rhode Island Department of Veterans of Foreign Wars as well as a National Council Member #18 for CT & RI & MD. He was a member of the H.W. Merrill Post #16 of the American Legion of Westerly, a life member of the VFW National Home for Children, the Westerly Lodge of Elks #678, the Westerly Yacht Club, the Tuesday Night Golf Club, the Knights of Columbus, Troop Commitee Leader #10 and the Gold Legacy. Chuck was a great fan of John Wayne. In lieu of flowers, contributions can be made to the VFW National Home for Children, 3573 South Waverly Road, Eaton Rapids, MI 48827. Mr. Azzinaro’s family would like to extend their thanks to the South Home Team – Meghan, Lauren and Hannah, you all made Chuck’s time very comfortable. Thank you again.